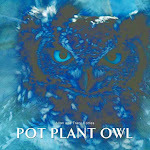 Pot Plant Owl: Day 5 - and is this the third chick? Beautiful photo Allan! (or Tracy :-) I love the way PPO is tenderly looking down at her babies and protecting them. Thank you for allowing us to see this marvelous miracle! PPO just left (00:26), no egg visible anymore, and a tiny tiny owlet - assume that's # 3. She's back again (00:29) and quickly settles. Love the picture and your account of the school visit - just hilarious! What a precious picture! Thanks for sharing!